However, I really don’t love making cornbread from scratch — and I REALLY don’t love how dry and stale tasting straight-from-the-box cornbread is. So I figured there had to be a happy medium. Something with great flavor and texture, but a lot easier than 100% from-scratch cornbread. 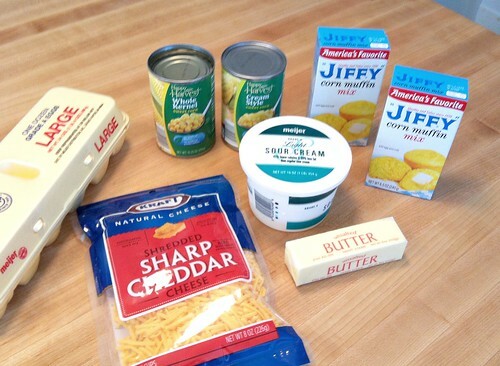 Back in September, I tried out a few different cornbread recipe combinations in preparation for our Soup and Bread Buffet party. I was a bit nervous as I put this recipe in the oven only about 45 minutes before guests were going to arrive. After all, if it didn’t turn out, I wouldn’t have time to start over again. However, I’m happy to say that the recipe was a HUGE success and there wasn’t even one crumb left at the end off the night! I’ll definitely be making this again for our Thanksgiving feast with Dave’s family next week — and I thought now would be the perfect time to share the recipe with you. NOTE: You don’t need to add the entire can of (or any) whole kernel corn if you don’t love the corn kernels in your bread. This cornbread is VERY dense — like a heavy chocolate brownie — but that’s one of the reasons I love it so much. You can eat it with your hands or with a fork. Another thing I love about this recipe is that although the cornbread is absolutely delicious hot out of the oven, it also tastes fabulous cold (or reheated) as leftovers. One tip I often use is to make the batter ahead of time and put it in the pan. Then I can simply pop the pan in the oven about 40 minutes before dinner and enjoy hot-out-of-the-oven corn bread with our meal! So like I mentioned above, if you’re looking for a super yummy, super easy cornbread recipe that will have everyone thinking you made it from scratch… give this one a try! Since Thanksgiving is next week, I thought I’d share links to a few more of my favorite Thanksgiving foods — all nicely organized in once place for your convenience. Don’t forget to save all the meat juices and bone for homemade broth! What foods will be on your Thanksgiving table this year? Does this do well cooked in a muffin pan? I’ve never made it that way, but I’m sure you could try. Just make sure it’s well greased! For all the readers, like me, who often wonder if some random recipe is worth the time, effort and expense let me assure you that when it comes to this cornbread recipe, you will not be disappointed. My goodness. 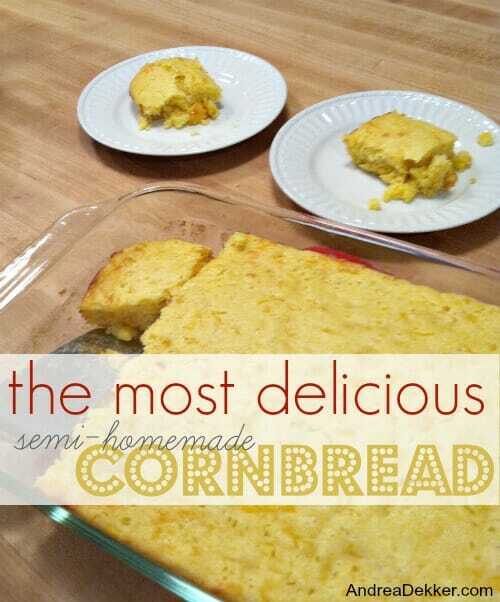 I’ve never eaten cornbread like this and it now in my personal recipe collection. Do you think I can use plain greek yogurt in place of sour cream? yes, it should work just fine! I made this for Thanksgiving. It was delicious. Thanks for the recipe! 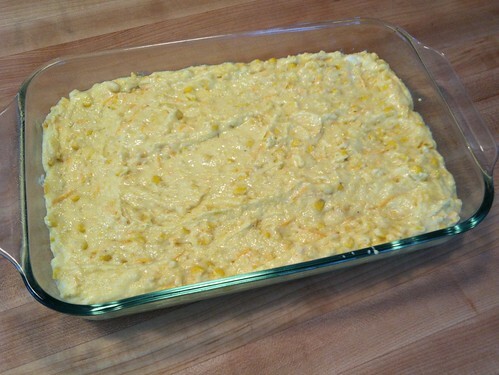 Call this corn pudding or casserole. Same recipe I have used since the 1980’s. Yummy! 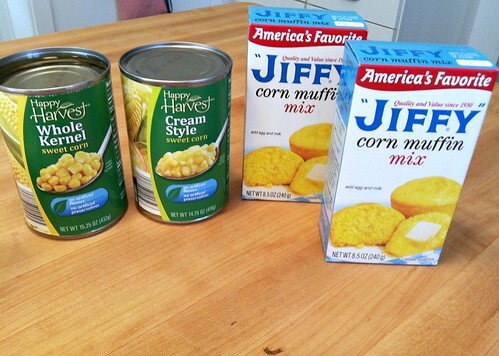 Jiffy Corn Muffin Mix is our go to. Love it. We make the Johnnie Cakes from the mix too and top it with over easy eggs and the yokes ooze down over the butterly corn cake. Delicious! We add a few chopped green chiles for a Southwestern flavor. 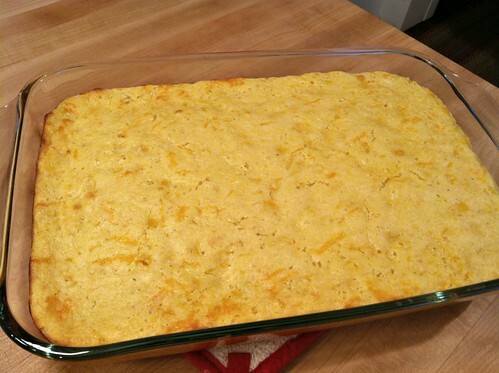 I love good cornbread – can’t wait to try this one. 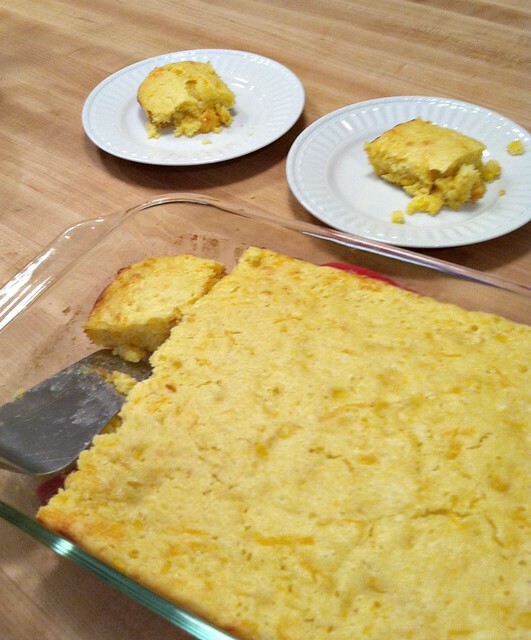 I make my grandmother’s cornbread often – it is so easy and quick and very tasty. Put oil in iron skillet and place in oven at 425 while you mix the other ingredients. When the skillet is hot, pour in the batter and bake for about 30 minutes – or until golden. I usually double the mix. It is amazing!! I use this recipe but mine only calls for 1 egg and a 16 oz. sour cream – love it! – funny how recipes get changed with everyone’s liking. Yeah — I saw SO many recipes that were similar to mine — I’m sure they all taste relatively the same (a.k.a. delicious)!! I bake 99% from scratch, but cornbread, I do out of a box or pouch every time. The 8×8 pan is the right size for the four of us and it is so cheap. Ghiradelli Brownies are the other thing that I use a box for, they are the best, why reinvent the wheel? Thanks Deni — and you’re welcome!